I like, The Little Engine That Could. This review/giveaway was sponsored by MyBlogSpark. 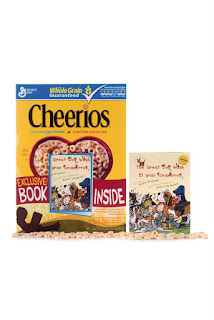 The Cheerios Spoonfuls of Stories program has distributed over 35 million children's books free inside cereal boxes since it began seven years ago. In that time, it has also raised nearly $3 million to benefit First Book, a non-profit organization dedicated to promoting literacy by providing much-needed books to children from low-income families. Although the main mission of Cheerios Spoonfuls of Stories program is to nurture a love of reading, it also seeks to discover and actively encourage previously unpublished, up-and-coming children´s book authors. Entries for the Cheerios Spoonfuls of Stories New Author Contest are being accepted March 16 through July 15, 2009 and will be judged on appropriate story and content for children ages 3-8, emotional connection, writing quality, uniqueness, and read-aloud potential. If you think you might have the next great kid's book floating around in your head, why not take a chance and enter? Shellie Braeuner's The Great Dog Wash was the 2007 Grand Prize Winner. A nanny from Nashville, Braeuner won a $5,000 cash prize and the opportunity to have her book reviewed by Simon and Schuster Children's Publishing. They loved her story and will publish the book, illustrated by Robert Neubecker, in hardcover this summer. In addition, The Great Dog Wash will be available free inside 1.5 million boxes of Cheerios. The Cheerios Spoonfuls of Stories edition of The Great Dog Wash has been specially printed in paperback in both English and Spanish. 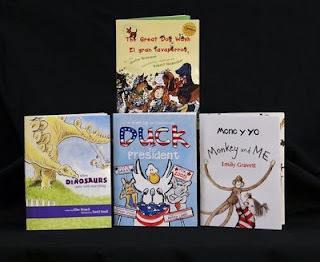 We received The Great Dog Wash along with three other special edition books from the Cheerios Spoonfuls of Stories series: Duck for President, Monkey and Me, and When Dinosaurs Came with Everything. The smaller paperback format (about the size of a TV Guide) is great for sticking in your purse for storytime on-the-go. To enter and win your own Cheerios Spoonfuls of Stories book set (the same four titles pictured above), please comment on this post with the name of your favorite children's book. Entries will be accepted through June 17th and I'll pick the winner using Random.org. US readers are eligible. Where the Wild Things Are is my favorite! My favorite was The Little Engine That Could. A sentimental favorite is Ernie's Big Mess because my brother was OBSESSED with it and therefore we heard it thousands of times. For the new generation I've been enjoying Knuffle Bunny and Click Clack Moo. My favorite is the "Little Engine". My favorite children's book is The Pokey Little Puppy. I think i grew up loving Mother Goose's stories. I love Cinderella. My Fav book was Green Eggs & Ham. My favorite childrens book was Clifford the Red dog. My fav is Hungry Caterpillar !!! My favorite children's story is Are You My Mother? The Little Engine That Could! Our favorite children's book is a French classic called "Roule Galette," which is very similar to "The Gingerbread Man." Thanks! I faved you on Technorati (Mamandetrois). Okay, maybe it wasn't really a children's book, but I got "The Wizard of Oz" from the Bookmobile when I was young and read it until its spine was no longer. It's my favorite movie to this day.